Throughout much of its recent history, the remote Western Himalayan region of Ladakh remained largely unaffected by developments occurring beyond its geographical borders. This relative isolation, which lasted until the late 1970s, has enabled its rich artistic and architectural heritage to escape the same fate that befell the great majority of historical buildings in the rest of the Tibetan Buddhist world. Thus, Ladakh’s ancient monuments have survived to become irreplaceable and in some cases unique examples of this great artistic and building tradition. The radical changes that have taken place in the past years have exposed the fragility of this heritage. 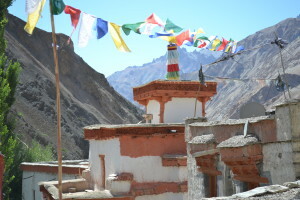 The loss of traditional know-how, economic migration, rapid and uncoordinated development, climate change, and the recent surge of tourist activity in the region are increasingly becoming major threats to the ancient monasteries and historic villages which are among the most valuable cultural resources of the Ladakhi people. At the beginning of 2009, an initiative was launched with the goal of empowering and enabling local communities to take the protection, maintenance, and management of their cultural heritage into their own hands. A three-year pilot training program was started with support from the Achi Association (a Swiss-based non-profit organization which has been active in the region carrying out conservation work) and thanks to a grant awarded by the Getty Trust for this purpose. The program targeted Ladakhi young men and women who are expected to play an important role in the future of the region’s heritage. A group of college graduates and young monks and nuns from a dozen different villages thus participated in a series of workshops, excursions and field campaigns. 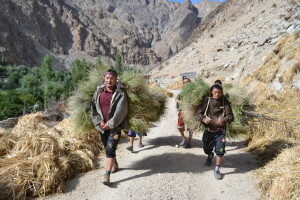 Work has been initiated in the village of Wanla, which was chosen as the setting for the training program due to its important historical and religious monuments, as well as its conservation challenges. At Wanla, the program participants were able to carry out a documentation exercise, producing measured drawings for the historical site and the two adjacent villages. Photographs, sketches, and interviews of elderly community members supplement the information. The group also successfully completed the rehabilitation of the historical ceremonial access to the temple in Wanla. Members of the core group passed on their newly acquired skills to the younger students and lead them in the task of documenting some historic and religious structures in their villages, sometimes working with 45 local boys and girls maintaining and repairing religious structures. 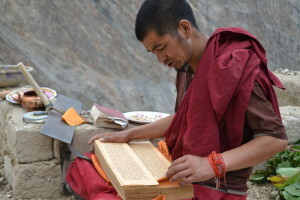 The high level of motivation and commitment in the group and the willingness to translate this new awareness into concrete action is reflected by their work in Skurbuchan, where they implemented urgent and comprehensive restoration work on the temple with the active participation of the community during two summers. 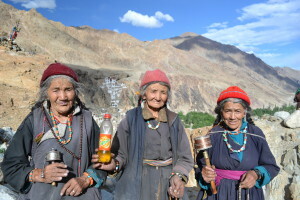 The group has also executed heritage awareness and monitoring campaigns in different villages in Ladakh. Watch a video on youtube on the youth training program. View the site plan that the youth group has produced together with the communities.